There’s just one more game left in the first round of the Stanley Cup Playoffs. 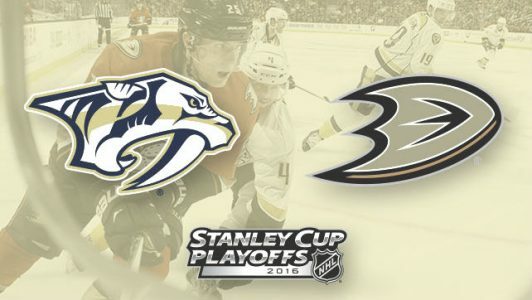 The Anaheim Ducks will entertain the Nashville Predators Wednesday night (10 PM ET, NBCSN) for Game 7 of their Western Conference quarterfinal as Nashville managed to extend the series with a 3-1 victory on Monday. Pekka Rinne has not enjoyed his best season but was a beast in net for the Preds and stopped 26 of the 27 shots he faced. He has bounced back from atrocious performances in Game 3 through 5 when he gave up a total of 11 goals. The Ducks (46-25-11 during the regular season) entered the series as big favorites and expected an easy series after winning their fourth straight Pacific Division title, but Nashville (41-27-14) had other plans. Anaheim was available at +800 on the Stanley Cup futures market going into the playoffs, compared to +2500 for the Predators, but the Preds took each of the first two games in the series by a 3-2 scoreline and has knotted this series despite getting outscored 17-12. Craig Smith (21 goals, 37 points) made his return to Nashville’s second line Monday night. The talented right winger was injured early in Game 3, after the Predators had taken the first two games in Anaheim, and while he was held scoreless Monday, the Predators have won all three full games Smith has played in this series. Predators are 11-5 in their last 16 after allowing 2 goals or less in their previous game. Predators are 2-6 in their last 8 road games vs. a team with a winning home record. Ducks are 9-3 in their last 12 Conference Quarterfinals games. Ducks are 14-5 in their last 19 after scoring 2 goals or less in their previous game. Ducks are 1-4 in their last 5 home games vs. a team with a losing road record.